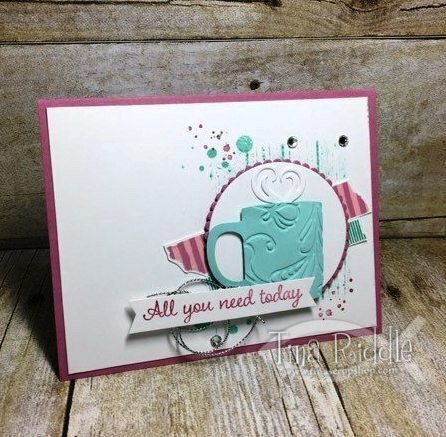 Tina's Crop Shop: PCC214 - Sketch Challenge! Hello and Happy Hump Day! Hope you are having an awesome week! Since it is Wednesday, I'm back over at Paper Craft Crew with my take on another awesome sketch challenge! Oh and another fun fact, this is a 2 week challenge! That gives you even more time! I hope you'll head over and check out all of the super cool inspiration! 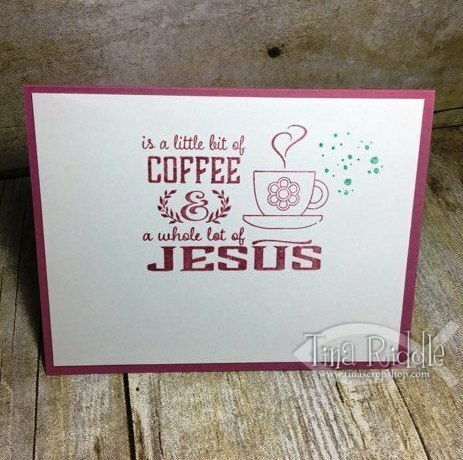 For some reason I seem to be obsessed with coffee cards lately! So of course, that was my theme for this week's card! I started out with an A2 card base of Sweet Sugarplum. My next layer was Whisper White. I used some Inkadinkadoo Masking Paper to mask off most of the white layer so that I could stamp with Hardwood stamp in Pool Party in the section that I wanted it stamped. I then ran a couple of pieces of the Playful Palette Washi Tape onto strips of Whisper White cardstock and fussy cut it and then adhered over the Hardwood stamped section. I then stamped a few splatters from Gorgeous Grunge as well as the Timeless Textures Stamp Set in both Pool Party and Sweet SugarPlum. Using the Layering Circle Framelits, I cut out a Whisper White Circle and a Sweet Sugarplum scallop to mount it on. I used the retired Cups and Kettles Framelits to cut out a mug in Pool Party and then embossed it with a decorative swirl embossing folder. I added three Rhinestones as well as some Silver Cord Trim. I used one of my favorite stamp sets from Jillian Vance Designs called Simply Said Coffee & Jesus for the sentiment on the outside of this as well as the inside. I had to do a little stamp chomping to make this work.. it always makes me nervous but it worked just fine. lol The "All you need today" on the front of the card was the first line of a large stamp so I cut that line out so I could use it on the front. The rest of the stamp was used on the inside.. I LOVE this stamp set and I'm super happy that I didn't ruin it by making a wrong cut! After stamping the inside portion of the sentiment is Sweet Sugarplum I added a few more splatters in Pool Party. Love it! Awesome idea masking the hardwood bkg - clever! !